(i) No flux such as solder is necessary. So, welded parts can be easily recycled. (ii) Easy operation as only pressing buttons facilitates process automation and it does not require trained skills unlike arc welding and gas welding. (iii) As this welding is performed efficiently in a short period of time, it is suited high-volume production of low-cost products. (iv) Since welding is done in short time duration, it gives less heat-affected area on workpieces by resulting a beautiful appearance with less indentation. (v) Electric facility is required in some cases due to use of large current. Optimum welding parameters must be figured out before actual welding since those parameters depend on material and thickness of parts to be welded. Welding condition setting must be prepared. 1. Less skill is required to operate the resistance welding machine. 2.This type of welding is well suited for mass production as it gives a high production rate. 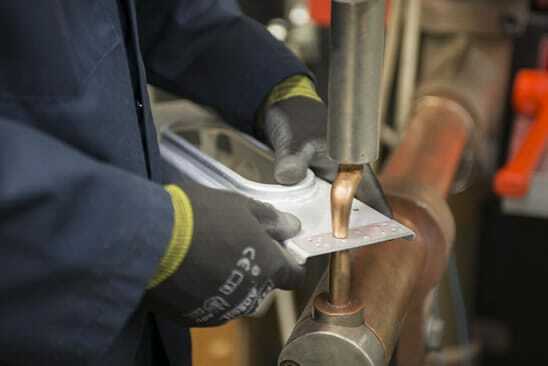 3.There is no need of using consumables such as brazing materials, solder or welding rods in this process except for the electrical power and a relatively smaller electrode wear. 4.Heating the workpiece is confined to a very small part which results less distortion. 5. It is possible to weld dissimilar metals as well as metal plates of different thickness. 6. It has a short process time. 7. It offers more safety to operator because of low voltage. 8. It produces clean and environmentally friendly weld. 9. A reliable electro-mechanical joint is formed. 10. The heat is localized, action is rapid and no filler metal is required. 11. The operation can be easily mechanized and automated due to the need of less skill. 12. Both reliability and reproducibility can be obtained with high degree. 13. The welding process is more economical. 1. The resistance welding machine is highly complex with various elements such as a heavy transformer, electrodes and heavy conductors for carrying the high currents, electrode force applying mechanism such as a pneumatic cylinder and its supply, heavy machine structure to support the large forces and an expensive timing arrangement. 2. Certain resistance welding processes are limited only to lap joints. 3. Spot welds have low tensile and fatigue strength. 4. Equipment is not portable as it is heavy. 5. The cost of equipment is high. 1. Resistance welding is used in mass production for welding sheet metal, wire and tubes. 2. It is used in welding bars, boxes, cans, rods, pipes and frames metals of medium and high resistance materials such as steel, stainless steel, monei metal and silicon bronze which are easy to weld. 4. It is used for making cutting tools. 5. It is used for making fuel tanks of cars, tractors etc. 6. It is used for making wire fabrics, grids, grills, mesh weld, containers etc.